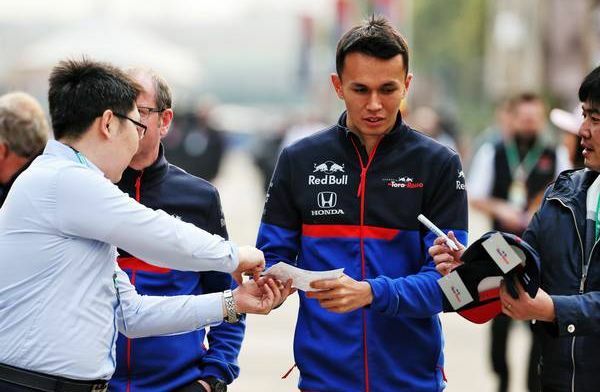 Alex Albon, driver of the day from the Chinese Grand Prix, praises the Formula 2 series as being the best preparation for Formula 1. Albon has picked up two more points than his teammate Daniil Kvyat so far this season. "To be honest, Formula 2 itself is a really good stepping stone for Formula 1. Even tyre management and all those things, they're directly related to Formula 2," he said. "Learning the tricks, from there it carries directly over to Formula 1." The rookie picked up a hard-fought point at the weekend having had a bad crash on Saturday. In a conversation with Sky Sports, he spoke about the crash. "I'd always been pushing that side of the track because it's quicker, you gain entry speed and you don't normally get punished on exit. Normally it spits you once, you get the one slap and then you're away. "This time it went once, it went twice - I thought 'that's a new snap' - it went a third time and then it was split - the car could either go right or go left. It went right, into the wall."